Ranpura - meherbabatravels jimdo page! Meher Baba and his men mandali had travelled on the " SS Narkunda " from Marseilles, France on the 18th December 1931 for Port Said, Egypt. Baba and the men then changed ships for the " SS Ranpura " which then took them to Bombay, India arriving 2nd January 1932.
he S. S. Ranpura arrived at 8:00 pm, late by seven hours.. She was a big boat, weighing 17,000 tons, and appeared quite majestic to our eager eyes when she was being towed alongside the quay. We were told to take our dinner before we embarked, which we very shortly did, hurrying through the courses, thinking all the time of the boat and what she might afford in the form of novelty and sports. When we arrived on the 'A' deck, the managers and the captain were asked to transmit farewell messages on the radio to the countrymen. Mr. Jagannath spoke of his confidence in every member of the team and the hope of success abroad. Dhyan Chand also spoke something to the same effect, while Mr. Gupta assured his listeners that an incident like cricketer Amarnath being sent back from England in 1936 would not happen in the case of the hockey team. Straightaway we went to our respective cabins which happened to be on the 'D' deck, except one cabin on the 'C' deck which was allotted to the manager. Stuffing our luggage under the berths, or wherever we could squeeze it in, and assuring ourselves that the ship would not sail before midnight, we went to sleep. Next day found us all but Mr. Gupta, Cullen and Tapsell in the cabins, seasick. The sea had been very rough, and the big boat had rocked and rolled all night. On learning that we should expect the same rough seas up to Aden, the sick resigned themselves to five days of forced rest in the cabins. It was, however, interspersed with occasional excursions to 'A' deck, where after a short rest, a violent attack of sea-sickness would force us to rush back to our cabins again. Nimal and Phillips were the worst sufferers amongst us. Often they wished they had not undertaken the tour when rough seas were expected. 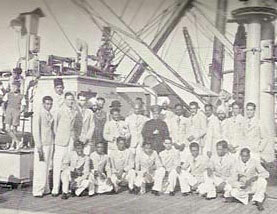 His Highness, the Maharaja of Mysore, with his suite of thirty passengers, including the Yuvaraj, was an interesting personage on board the ship. A major portion of his staff travelled with us in second class, but as they happened to be members of the personal staff of an Indian prince, aloofness and reserve were regarded as safe barriers for a common crowd like us. The Maharaja and the Yuvaraj appeared to be very simple in habits as well as in dress. Often they passed hours on our side of the ship, gossiping with the members of their staff in Tamil, Kannada or Telugu, which were all Greek to us. The Maharaja had left Indian shores for the first time in his long life with a view to being operated upon in England. Being an orthodox Hindu, he brought everything necessary for the preparation of his usual food, even the water of the holy Ganga. And, of course, his own cooks. Ten pounds of curds was sent every morning for our consumption, which we took in the form of 'lassi', the delight of our Punjabi friends. History On 6 September 1939 the passenger ship Ranpura of the P. & O. Steam Navigation Co Ltd, London was requisitioned by the Admiralty and converted to an armed merchant cruiser. Conversion was completed on 30 November 1939. In May 1943 sold to the Admiralty and converted to a repair ship. Delivered by Hawthorn Leslie, Hebburn-on Tyne 23 March 1925 to P&O and employed by them on the Indian Mail Service. 16,585 GRT; 570 ft; Twin screw; Quadruple expansion steam engines, 15,000 IHP = 17 knots. Passengers: 310 first class, 280 second class. Crew: 380. In December 1939 she was converted into an Armed Merchant Cruiser. Bought by the Admiralty in 1942 and rebuilt as a Heavy Repair Ship. Recommissioned in 1944 as HMS Ranpura. Scrapped at La Spezia in 1961.